Eric wanted a rest day, so he used it to spend some hours in the Ouray hot springs before picking up our friend Steve at the Montrose airport in the afternoon. I had driven up to Cinnamon Pass at 12,600ft to spend the night and do some hiking the next day while Eric rested. Though exposed, it was a nice camp location just below Cinnamon Pass on the west side, a small turnout along the Alpine Loop road going over the pass. There were some strong winds and some rain in the evening before I went to sleep, but I was comfortably set inside the jeep. I hadn't figured out where I was going to hike until I had driven up to Cinnamon Pass and noted Animas Forks Mtn, a P1K, looming high to the northwest. A quick study of the GPSr showed 6-8 peaks I might collect on a half day outing around the north side of the pass. Good deal! I awoke just after 6a without an alarm. Without Eric, I wasn't incentized to get up before sunrise. Clouds from the previous evening's storms were still hanging around, keeping a lid on the sunshine, but no rain during the morning and really nice conditions for hiking. Starting out at 6:30a, I headed first to Animas Forks Mtn. I wasn't sure if I'd be able to find a good descent route if I visited it last, so figured hitting it first would give me a chance to find if I could get through the small cliff band on the east side. 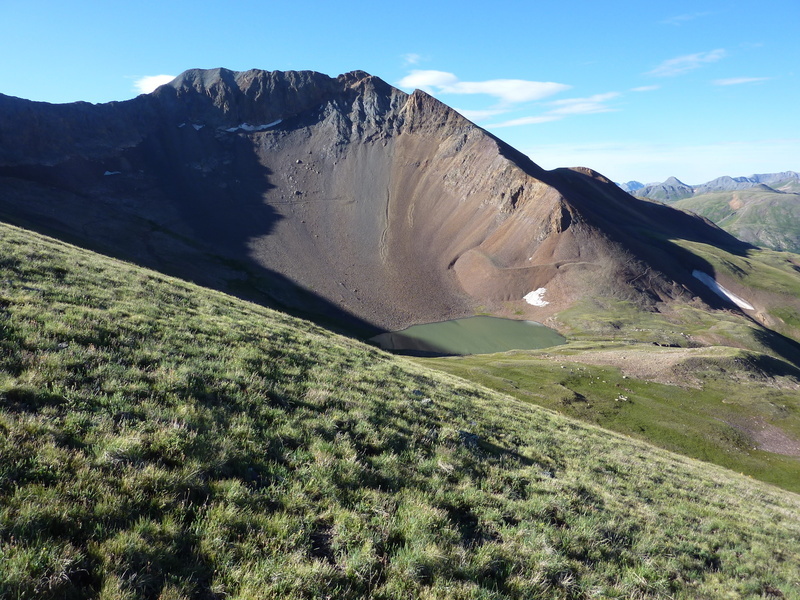 I traversed high around the Cinnamon Creek basin, passing below Wood Mtn and making my way over to the East Ridge of Animas Forks Mtn. I found class 2-3 scrambling over loose terrain, but not really dangerous - just lots and lots of talus to get myself to the summit by 7:40. Finding no register, I took a few pictures of the fine views before turning my attention to Peak 13,708ft, half a mile to the northeast. The two summit are connected by a narrow ridgeline that has steep cliffs on either side, but some surprisingly fun and easy scrambling along the very top. This was easily the best scrambling of the outing. Reaching Peak 13,708ft just after 8a, I turned northwest in the direction of Seigal Mtn and Engineer Pass. I had seen the peak from Engineer Mtn a few days earlier and regretted not paying it a visit. I now discovered it was a mere 3/4mi from Peak 13,708ft, connected by a ridgeline. I had to drop some 800ft to a saddle between the two, down lots of talus that would have to be reascended. Luckily there are good sections of a use trail that can be used to make this easier. The saddle is called Denver Pass, connecting the Horseshoe Creek drainage to the southwest with Hurricane Basin to the northeast. There is much cabling and rotting timbers, remnants of what appear to have been power lines run across the pass. The climb up to Seigal Mtn is pretty tame, made easy by grass slopes for most of the SE Ridge's length. On my way back down to Denver Pass, I considered dropping into Hurricane Basin and then across the other side to climb Gravel Mtn and Peak 13,688ft. This would have involved dropping about 600ft and then climbing 1,300ft up the west side of Gravel Mtn. The problem, as I saw it, was that I wasn't sure if the jagged ridgeline between Peak 13,688ft and Wood Mtn could be done without serious risk. Not knowing ahead of time what the ridge entailed, I decided the safer bet was to reclimb Peak 13,708ft. I scaled this peak a second time, then headed east along the ridge towards Wood Mtn. More talus along this route, but nothing more than class 2. After leaving my new friend, I continued northeast towards unnamed 13,427ft, a mile and a third from Wood Mtn. I found an old road on the southeast side of the ridge which made things faster than if I'd followed the ridge more directly. After a longish walk on easy terrain that pushed a herd of deer off the ridge, I reached the summit just before 11a. I found the only register of the day at this summit. The first entry had christened it "North Edith Mtn", and I figured that was as good as any and used it here. To no great surprise, the register was wet and unwritable, much as I'd been finding most registers on this trip. I disturbed a pair of ptarmigans as I was leaving the summit, though not so much, as they merely waddled out of the way instead of flying off. My last summit for the day was Edith Mtn, 4/5mi to the south across Cleveland Gulch. I dropped 1,200ft down grassy slopes to the creek running down the middle of the gulch, reaching the lowest point of the whole outing at 12,200ft. I then climbed 400ft up the south side of the gulch to reach a nice ridgeline about half a mile west of Edith Mtn. A pleasant stroll brought me to the end of the ridge where Edith Mtn's summit is officially located, though it has very little prominence there. It overlooks the Lake Fork of the Gunnison River with nice views of >Whitecross Mtn and Handies Peak (a 14er) on the other side of the wide canyon. Turning back to the west, it took me about 40min to retrace the route along the ridge and the rest of the way back to Cinnamon Pass, all over easy grass slopes. The sounds of ATVs and motorcycles could be heard during much of the hike and Cinnamon Pass was crowded with dozens of vehicles stopping to take in the views. A few of the occupants would climb the small hills on either side of the pass, but I didn't see anyone (besides my 68yr-old friend) venture more than a quarter mile from the road. Good to have so much open country to myself for the morning.